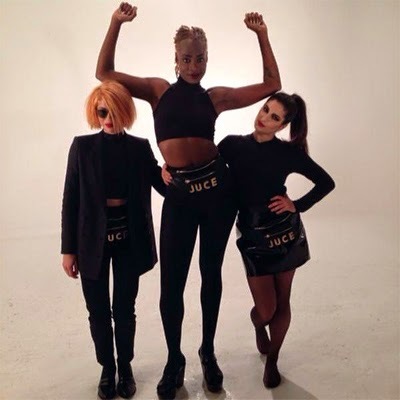 Last week, the internet's favourite new girlband Juce signed up with Island Records. The deal was based on the strength of their single Call You Out, which very much sounds like Haim covering SWV (ie very good indeed). The contract means they're going to start recording an album - which I predict will be (a) better than and (b) out before any new material from Mutya, Keisha, Siobhan. 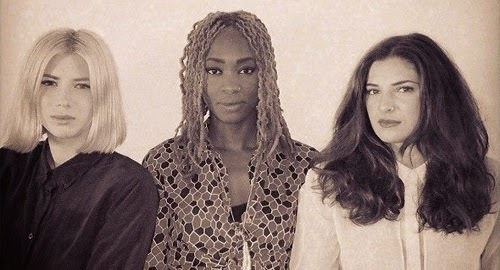 For the uninitiated, Juce are Georgia, Chalin and Cherish - three girls from London, one of whom is a giant. Eschewing the traditional vocal harmony group model, they write their own material and play their own instruments. You can see them in action, via a busking video they recorded outside Radio 1's London HQ on Friday. To celebrate their new deal, the band donated a new song to Annie Mac's Free Music Mondays last night. (H)ours is a energetic slab of funk, built around a bassline that struts around like Mick Jagger doing the chicken dance through a minefield. The singer (Chalin, I think) shows impressive range, too: Her voice scraping the floorboards in the first verse, before a long, slow climb to a roof-raising shriek at the four-minute mark. It's not the instant earworm that Call You Out turned out to be - but for a free MP3, it's pretty terrific. Just click through to Annie Mac's Soundcloud page for the download link.